River East School-to-Career. It Works! 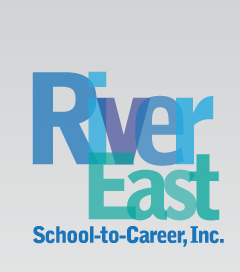 River East School-to-Career, Inc. It Works! Proceeds from the sales support River East programs. River East School-to-Career, Inc., a business and education partnership, was incorporated as a nonprofit 501(c)(3) organization in February 2004. The River East School-to-Career Partnership is governed by a twenty member Board of Directors with representatives from our member school districts, postsecondary institutions, and the business community. Member school districts include Belchertown, Hampden-Wilbraham, Ludlow, Monson, Palmer, Pathfinder Regional Vocational Technical High School, and Ware. Over the past five years, more than three hundred businesses and organizations supported School-to-Career programs by providing jobs, internships, co-operative education placements, and job shadow experiences for students. They participated in career days, served on advisory boards and curriculum development panels, as well as provided support through sponsorships, fundraising, and in-kind contributions. By providing these experiences, employers are helping students to explore their career interests and develop the skills needed for success in the workplace.